We'll be the first to admit that workforce management and Employee time clock software isn't the first way most businesses think to cut costs or increase revenue. Changing suppliers, adjusting supply chains, and new product releases are all more common places to start. But employee payroll usually accounts for 30 to 50 percent of a business’s expenses. Outdated workforce management and time clock software accounts for thousands of wasted dollars every year. One study found that businesses that updated their workforce management and time clock software saved over $1,600 per employee! So why do businesses overlook this critical part of streamlining their companies? Many businesses simply overlook it because they don’t realize how big of an impact it can have. Others think their current system is good enough, or worry that the cost of switching would be too high. But new time tracking systems are affordable and easy-to-learn. It can also help you manage your workforce, give employees better insight into their schedules, and save money. New time clock systems have little in common with traditional sheets of paper, Excel spreadsheets, or old-fashioned card systems used by many companies. So what should you know about modern time clock software before giving it a try? Not updating your time tracking system can be expensive. Inaccurate time sheets can lead to an inflated payroll. And the time it takes to calculate payroll adds up, especially if you have a lot of employees. Time clock and workforce management software eliminates the need for managers to manually calculate payroll by generating those reports for you, using the information recorded and stored by the software. What do these savings look like? 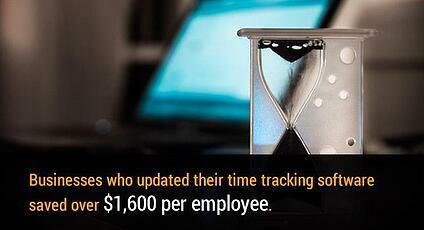 ● Automated workforce management and time clock software saves big businesses an average of $1,600 per employee. ● 39 percent of companies that use automated workforce management solutions reduce the time they spend on payroll. ● 31 percent of companies cut their payroll expenses with time clock software. Automated time tracking can also help protect you from the cost of wage lawsuits. If inaccurate time tracking results in unpaid overtime, businesses open themselves up to legal problems. In 2011, the U.S. Labor Department recovered more than $225 million in unpaid wages. With workforce management and time clock software, you can trust employees are getting paid for the exact number of hours they work - no more, no less. Less than half of all businesses have made the switch to time tracking. In fact, 40 percent of businesses still calculate payroll by hand. And since payroll is one of the biggest expenses for most businesses, there’s a lot of room for error. But those numbers go away when you look at “best-in-class” businesses. These businesses are considered the most successful, highest-performing businesses within their industries. And among these businesses, a full 88 percent use automated time tracking or attendance software. The use of workforce management and time clock software in professional services is growing. That’s because newer controls offer the ability to track time for different projects, allowing workers to bill for their services more accurately. In the past, inaccurate time sheets resulted in an average loss of $110,000 annually for professional businesses. Newer workforce management software also assists and empowers employees. It removes the time spent tracking their schedules and filling out timesheets allowing them to focus on the tasks they were actually hired to do. These software products also allow employees to see where they’re spending their time and make adjustments, as well as log in to see the hours they’ve worked. Cloud-based software is growing in popularity. Cloud-based software addresses the needs of today’s workforce. Employers can customize cloud-based software to allow employees to clock-in from different devices. This can include laptops or mobile phones, which is helpful if you have employees who are out in the field or work from home. Managers can also manage the locations that employees can clock-in from, which is great for businesses with more than one location. But, because today’s time clocks are software-based, you won’t have to purchase or maintain different pieces of software. We often have people ask us where the hardware is. There’s no physical time clock or card scanner because time clock software simply does not need it. It may be hard to wrap your head around, but no hardware is a good thing for businesses. Time clocks and other devices are used multiple times everyday, by all employees, making them prone to breaking. Physical time clocks require a lot of maintenance, but software isn’t subjected to the same wear and tear. Physical time clocks are also more difficult to update. Potential updates often need to be done by hand, usually by a professional technician. Cloud-based time clocks, on the other hand, are maintained and updated for you, automatically.